Is Fibromyalgia Neurological Illness Or Autoimmune Illness | Troy C. Wagstaff aka CallahanWriter Blog: Topics of interest include Western Historical (1865-1899) Topics. Additionally inspirational Christian and Fibromyalgia interests. With all the anecdotal evidence with Lyrica, Neurotin and anti seizure medicines being used so frequently, I assume fibro is a neurological illness, or an illness with a large neurological component. Those stating that it is an autoimmune illness seems to be making that claim to sell home remedy and herbs. No ad results were used. Only clicked on what appears to be an article on the topic of the keyword entered. The first set of keywords used was “fibromyalgia autoimmune illness” and the second set of keywords was “fibromyalgia Neurological Illness”. This is not a scientific study by any means, but it does create more compelling evidence as to whether fibromyalgia is neurological disorder or an autoimmune disorder. Conclusion: I read twenty articles and of them comes the following conclusions: Six articles said is was a neurological disease, one article said it was a autoimmune disease. Seven articles said it was not an autoimmune disease. Five articles were inconclusive. Any articles in Purple are recommended as a good read. (3) Autoimmune Disease Fact Sheet. Are chronic fatigue syndrome and fibromyalgia autoimmune diseases? Chronic fatigue syndrome (CFS) and fibromyalgia (FM) are not autoimmune diseases. But they often have symptoms of autoimmune disease, like being tired all the time and pain. 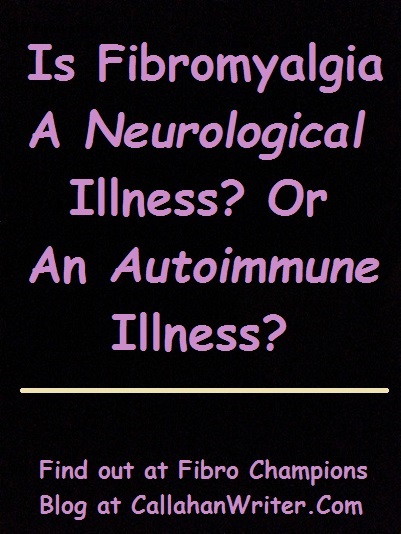 (6) Is Fibromyalgia an Autoimmune Disease? No — or at least, it’s not classified as one at this time. (7) Is fibromyalgia an autoimmune disorder of endogenous vasoactive neuropeptides? (1) Fibromyalgia: Is Fibromyalgia Real? A growing body of information suggests fibromyalgia is a true neurological disorder. Objective: To determine the type and frequency of neurological signs and symptoms in individuals with fibromyalgia (FM). Conclusions: This blinded, controlled study demonstrated neurological physical examination findings in persons with FM. The FM group had more neurological symptoms than controls, with a moderate correlation between symptoms and signs. These findings have implications for the medical work-up of patients with FM. If you have fibromyalgia, some of your symptoms might be caused by a neurological disorder such as a cervical spinal cord compression (stenosis) and/or Chiara malformation. It is important for your long term health and for relief of pain, fatigue, and mental function, to rule out neurological conditions as part of your syndrome. If you answer yes to several of the following questions, you should take the initiative to be examined by a neurosurgeon for possible neurological implications. Fibromyalgia symptoms include widespread body pain, fatigue, poor sleep and mood problems. But all of these symptoms are common to many other conditions. And because fibromyalgia symptoms can occur alone or along with other conditions, it can take time to tease out which symptom is caused by what problem. To make things even more confusing, fibromyalgia symptoms can come and go over time. Its exact cause is unknown but is believed to involve psychological, genetic, neurobiological and environmental factors. There is evidence that environmental factors and certain genes increase the risk of developing fibromyalgia; these same genes are also associated with other functional somatic syndromes and major depressive disorder The central symptom of fibromyalgia, namely widespread pain, appears to stem from neurochemical imbalances and the activation of inflammatory pathways in the brain which results in abnormalities in pain-processing. The brains of people with fibromyalgia show functional and structural differences from those of people without fibromyalgia, but it is unclear whether the brain anomalies cause fibromyalgia symptoms, or are the product of an unknown underlying common cause. Some research suggests that these brain anomalies may be the result of childhood stress, or prolonged or severe stress. Conclusion – What type of illness is Fibromyalgia? Out of the top Ten sources for each pair of keywords, those articles states the any of the four or none of the four was the type of disease fibromyalgia is.